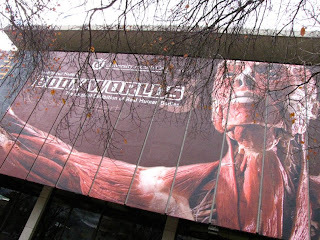 We were invited to join fellow unschoolers and go on a fieldtrip to see BodyWorlds 3. I hadn't planned on taking Maddie originally as I thought Trev and I could do a bit better without her (not to be rude, but... she's three...), but the date snuck up on me and I hadn't made any plans for her, so she tagged along. It was, of course, a fascinating exhibit. My favorite part was the nerves and neurons exhibit. Maddie liked the embryos and babies, and Trev liked best the body parts - "the brain and heart and stuff." Pretty dang cool. 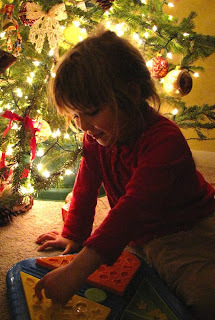 The rest of the day was spent quietly, mostly -- we discussed Trevelyn choosing his past. And if Mary Poppins really exists. And how big an umbrella it would take to float down from the sky. And if he can choose the time (era) to be born in in his next life. I wasn't really sure what to expect. When we first saw the website (in October), I called Trev, to have him check the presentation out with me. I thought maybe he'd be freaky about it, but he said, "Cool! I wanna go to that!" "Uh... are you sure?..." But he said he did. I asked Madd in the morning before we went, and gave her the option of me trying to scramble to find someone to watch her, but she wanted to go, too. They (Maddie's too young to be upset by it, so Trev) were totally okay with it. I really thought there might be a strange feeling there, people being upset or emotional, but it wasn't that way at all. Most people just walked around by themselves thinking and looking. With the children, I just read what they wanted to read, and skipped what they didn't. There was a camel at our exhibit, and Trev wanted to know "why that camel has three heads" and I showed him how they had cut it so that you could see the inner workings. I was surprised that he thought that, as many of the exhibit specimens were exposed that way. It actually wasn't gruesome at all for us, but very interesting. Not nearly as affecting as I thought it would be. It was more like a walk through the museum for us. Bones, explanations, and other info. Oh, that looks like such a super cool exhibit. We'd love that!